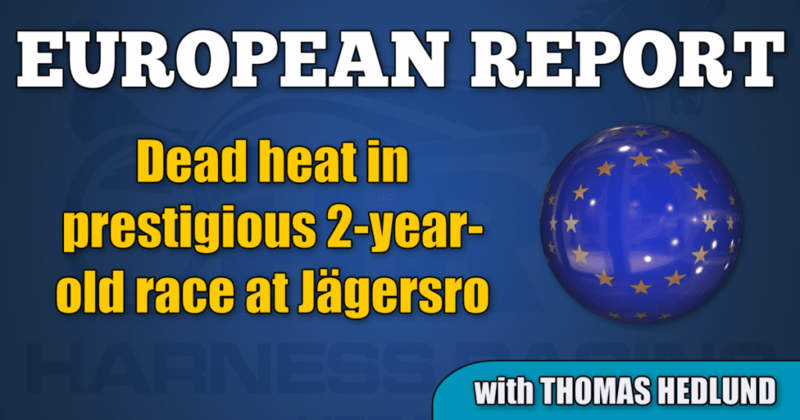 The $308,000 Uppfödningslöpningen for Swedish-bred 2-year-olds was held at Jägersro racetrack on Saturday afternoon and two horses shared the victory after a dramatic finish. Svante Båth had four horses in the final, among them, the first choice Bythebook (Googoo Gaagaa) and second choice Global Adventure (S.J.’s Caviar). Trixton son Trix On Line, out of top mare Fascination, opened quickly from post one behind the gate and kept the lead while Global Adventure’s driver Erik Adielsson chose to race without cover outside the leader. That gave a trip second over to Bythebook and driver Örjan Kihlström left that position and attacked three wide with a little less than a half mile to go. At that point, Global Adventure began to lose his gait and in the last turn he made an inevitable break. Bythebook seemed to sprint away to a comfortable victory, but the son of Googoo Gaagaa got hesitant when he was first in mid home stretch and from position far back in the field, trainer Sten O Jansson’s Belker (Scarlet Knight) finished illusively fast. When the horses crossed the wire, no camera could separate them, so Uppfödningslöpningen crowned two winners 2018. The winning time was 1:58.3 and Kihlström, who can look back at a career where he has won most of the biggest races in Europe, collected his first victory in this particular race. Torbjörn Jansson drove Sten O Jansson’s Scarlet Knight son Belker and the trainer from the island of Gotland has only one horse of a total of nine in his barn that races. A happy story for Jansson, who also is the breeder and owner of Belker, was satisfied with the result. “We had some problems in the first turn, which, most certainly, got expensive in the end of the race. Belker is just an extraordinary trotter, just like his trainer,” said Jansson. For Svante Båth, the victory with Bythebook was his third consecutive in the race and Båth has entered the winner’s circle in total five times after the oldest classic young horse-race in Sweden. The $90,000 Prix Vourasie for 2-year-old mares at Vincennes racetrack became a successful story for top trainer Sébastien Guarato and his Bold Eagle daughter Green Grass. Gabriele Gelormini sent Green Grass to the front and could rather easily keep their chasers behind them. This was Green Grass’ third victory in six starts and mile rate over 1.3 miles was 2:03. Dryade du Parc (Ludo de Castelle) won Prix Joseph Lafosse (€135,000) under saddle for jockey Eric Raffin. Wire to Wire was the recipe for the victory in mile rate of 1:57.4 over 1.7 miles.